Halloween is this Friday, and hopefully by now you’ve got your plans in place. Lori and I’s college alma mater is having its Homecoming this Halloween (yes we still attend those), and while we usually would be all aboard, our little guy would much rather be trick or treating so that’s our day plans for now. Once nightfall hits then it’s time for some “other” fun. Who says Halloween is only for kids? 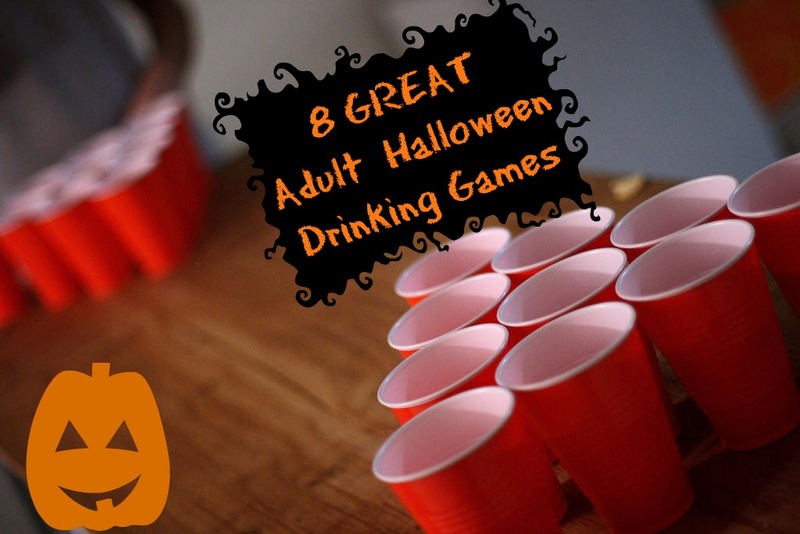 Not me, and to prove it I’ve made a list of 8 of my favorite Halloween drinking games to try if you’re hosting a party or attending one. As always though, be careful and drink responsibly. Bobbing for Liquor: Self explanatory, Take a huge bowl or tub, fill it with apples AND mini liquor bottles, and go bobbing for them. Scary Movie Drinking Game: Much like every award show, you play this game by taking a shot or a drink anytime something you guys choose happens. Ex: Take a shot every time a victim says “I’ll be right back”. You won’t likely need to pop in a movie, the entire week leading up to Halloween every scary movie imaginable will be on basic cable. Name That Dead Celebrity: I never heard of this one, but found it with a quick search on google. In this game you make name tags with dead celebrities on them, put them into a hat and everyone draws one and puts it on their back. Players try to guess who you are with “yes” or “no” type questions such as “am I a man”. Think 21 questions. The players must take a sip after every 5 questions and then can down the whole thing if they like after getting the answer right. In this Halloween party drinking game, players guess the name of the deceased celebrity on a name tag on their back. Morose, I know, but a fun way to break the ice. Monster Mash: By now everyone knows how to count and do basic math (I hope), but not everyone knows how to do them with a few shots in your system. In this game players count off out loud as they go around, except they must say “monsters” on numbers divisible by 3, and “mash” on numbers divisible by 5. Ex: “one…two…monster…four…mash…monster…seven…” Whoever makes a mistake takes a shot. Name That Bone: This one can get messy fast. Purchase a cheap skeleton (plastic, or cutout) and one by one each player has to name a specific bone on the body. You’ll want some reference materials like an anatomy book or just use google. Every time someone gets it wrong, SHOT. Mummy Wrap: Here’s a good one that gets everyone involved physically. Divide the group into teams. Using rolls of toilet paper you’ll wrap up one member as fast as possible. The fastest team wins, and the others have to down batches of some preferably STRONG Halloween Punch. Scary Beer Pong: If all else fails and you don’t have a super adventurous group, Beer pong is never a bad idea. Only replace the ping-pong balls with floating eyeballs. You can usually find these at a place like Party City. If you have any games we didn’t list that you think we should, shoot as an email to Info@intoxicology.net. Have a happy Halloween.